In the first part of our analysis of the Breitling 765 Avi, we stopped with the introduction of the panda dial variant in 1963. In the 1960’s, Breitling, a company almost exclusively dedicated to chronographs offered the iconic Navitimer and the Avi’s as two excellently designed chronographs that were used both in civilian and military applications. 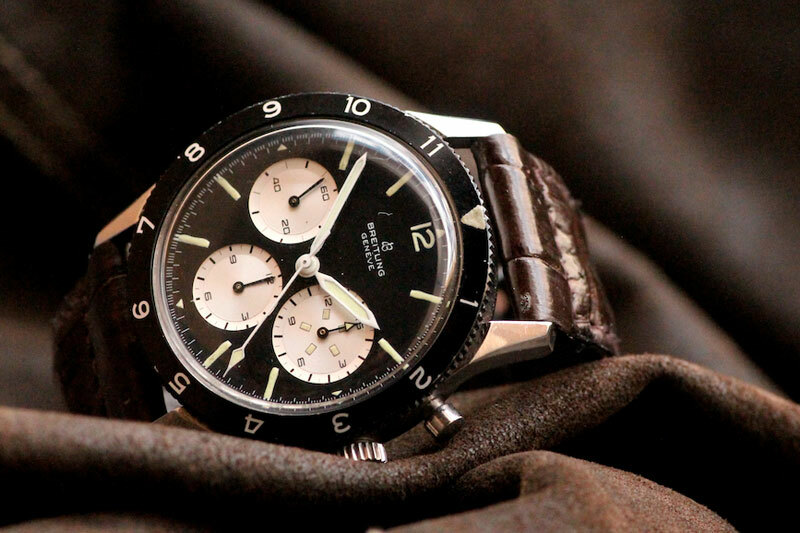 These two chronographs were doing extremely well, but the market started to change. 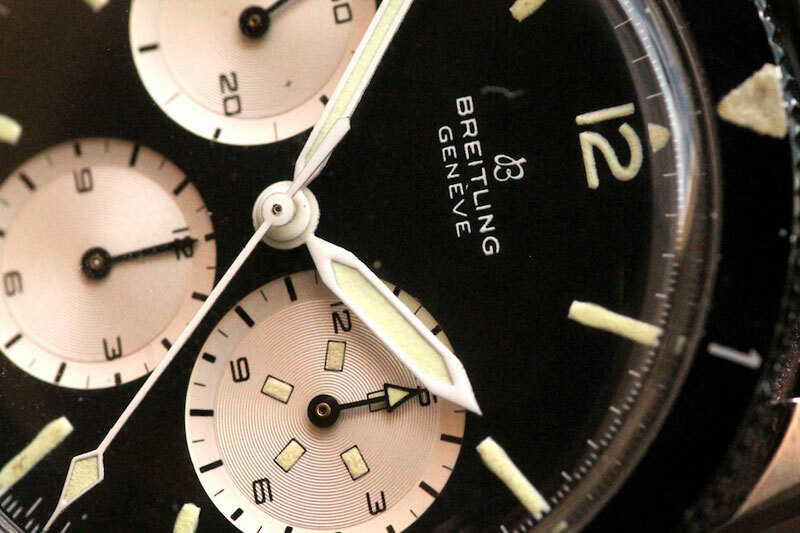 In this second part we will examine the transitional period of this family of chronographs from Breitling. Omega introduced the Speedmaster in 1957, mainly targeting auto-racing enthusiasts; this changed when in 1965 Ed White, as an astronaut of Gemini IV, wore a Speedmaster in the first American EVA (Extra-vehicular activity). 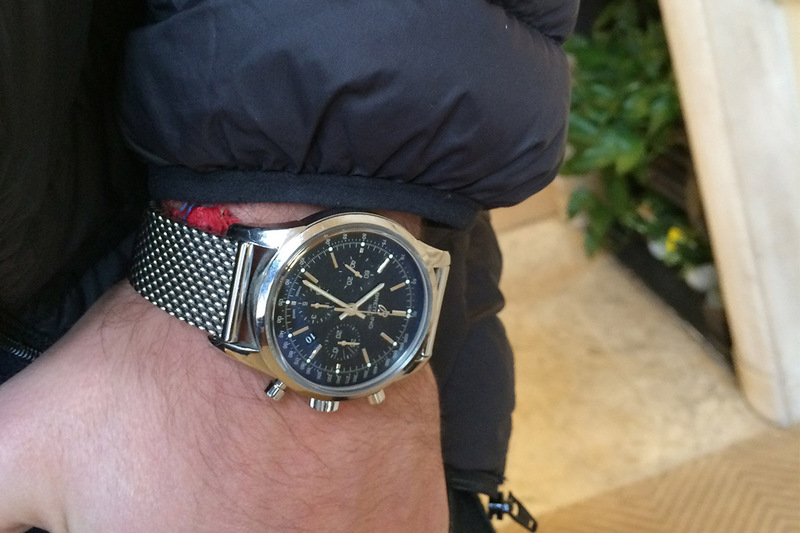 From that point on, the legend of the Speedy being an aviation/space watch was born. Rolex, a company mainly dedicated to sporty 3 hand watches (with an oyster case), decided to market the Daytona as well, with the first variation hitting the shops in 1964 (ref.6238). 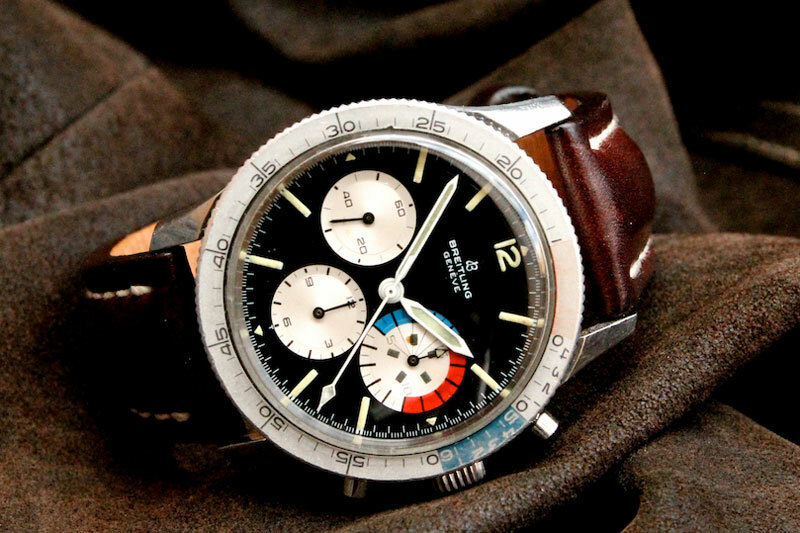 Zenith also produced excellent chronos with fantastic calibres (146D, 146H), but it was Heuer who decided to introduce two new chronos that truly altered the market for sport/aviation/motorsport chronographs. 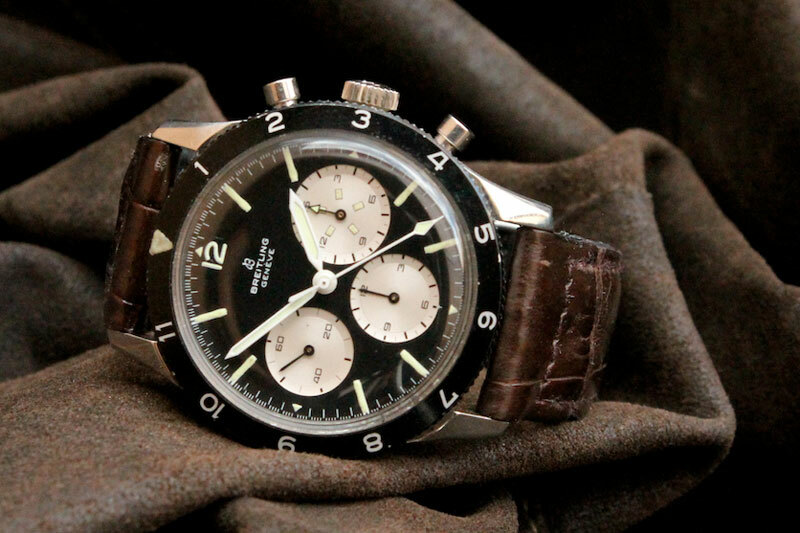 In 1962 we saw the introduction of the first Heuer Autavia and in 1963 of the first generation Carrera. Breitling had to reply to this attack by the other big swiss players, and decided to change the Avi series radically. In this second article we will examine how they did it and have a look at the various references up to first part of 1969. 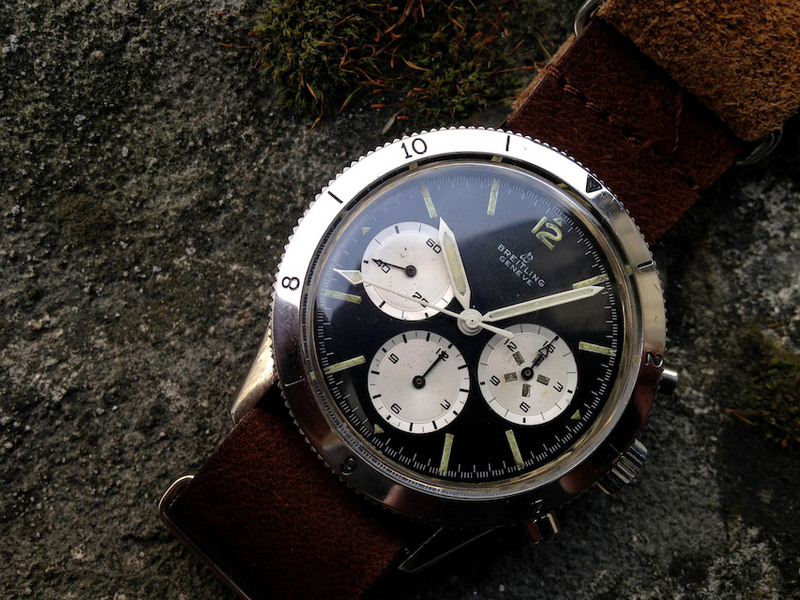 The first AVI was a large chronograph (41mm bezel diameter, 22 lug size) with a rotating 12h steel bezel. 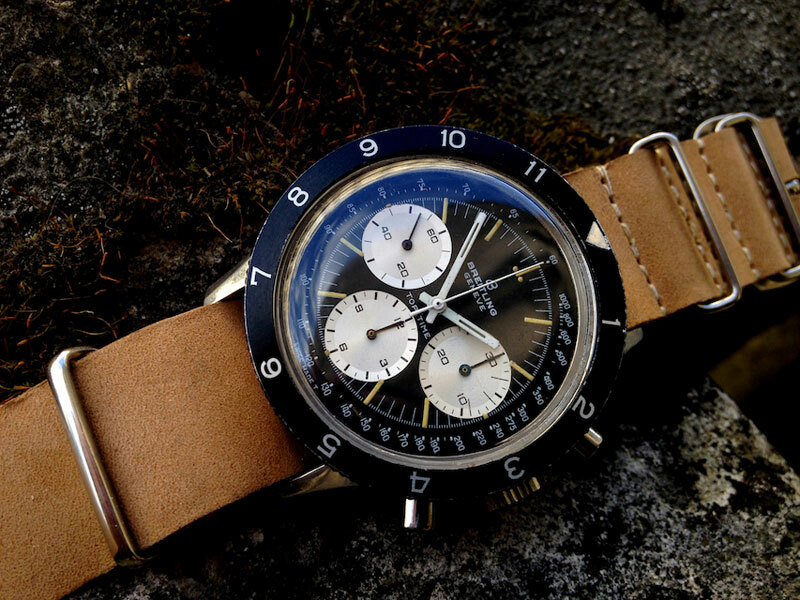 In 1965 the company decided to update it while at the same time keeping its fundamentals (case, dial, hands) the same. Firstly the designation AVI was deleted from the catalogues and official literature of the era, replaced by the acronym CP, which stands for Co-Pilot. 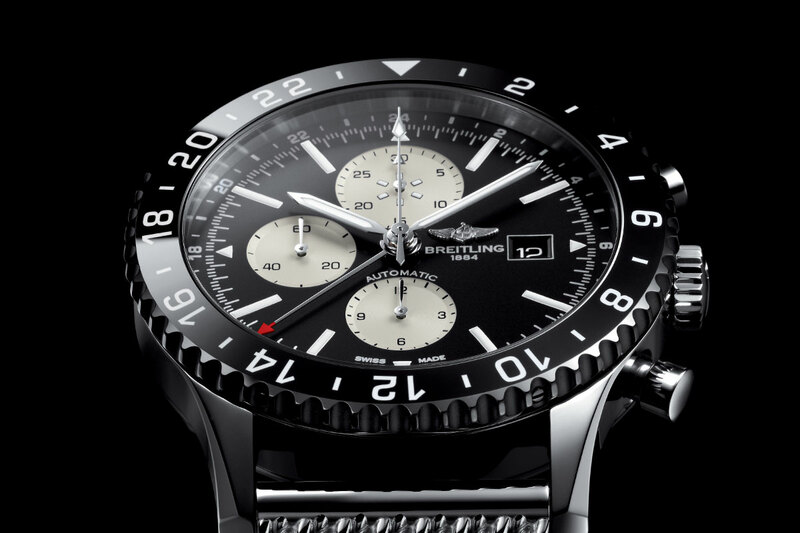 This was actually a very clever branding move by Breitling. The changes did not stop there. The material of the bezel changed from steel to anodized aluminium, while two distinct and different types of bezels were simultaneously introduced: a full black one and a half black/silver one. The first one is the Division 12, as Breitling referred to it in its catalogues; and the second was the Double Scale (12+60) bezel, which combined two scales for 60 minutes and 12 hours. Around the same time, Breitling presented another new chronograph, using the same recipe, which was intended for timing regatta races (recommend read: IN DEPTH: The Omega Seamaster Yachting – A Luxurious & Rare Regatta Chronograph from the 1970’s). The Yachting CP had its own two major distinctions: it had a 15 minute Yachting countdown sub-dial and a specially painted aluminium dial that was highly legible and usable for those kinds of races. These watches continued to be sold -and compete with- the offerings from Omega, Zenith, Heuer and Rolex up until 1967 when yet again the Yachting CP evolves. This time the ref.765 Yachting CP received a newly designed handset which made the whole aesthetically a more colourful departure from the austere and traditional form that had thus far characterised this specific family of watches. 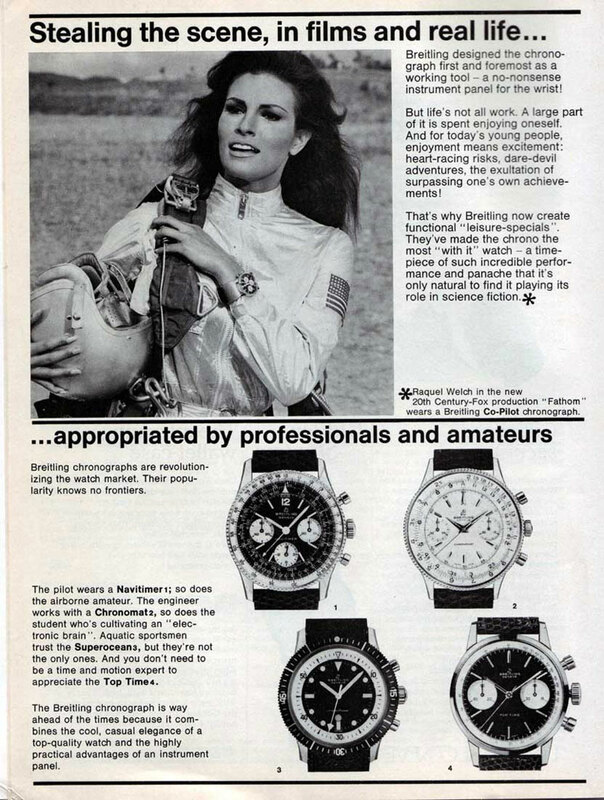 Two years later, in 1969, Breitling decided to stop using a separate name for these models and from then on, only the reference number identified the various watches. The Co-Pilot name was no more. At this point it is deemed important to understand that all these variants right from the start had the Venus cal.178, a hall of fame caliber in its own right. However here we must make a small detour by referring to two events that influenced the industry and the family of watches we examine here. 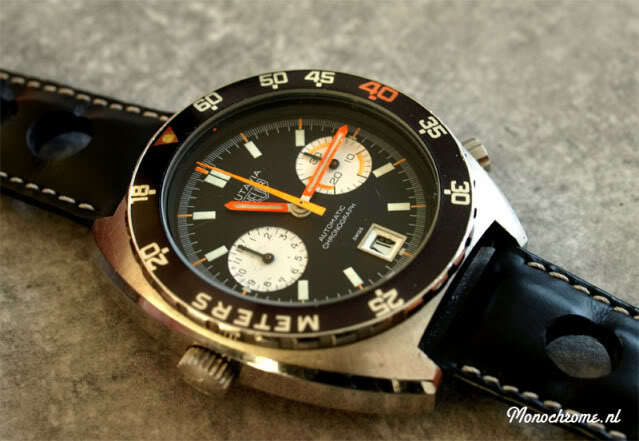 The swiss industry had experienced a massive decline in the sales of its chronograph watches in the late 1950’s due to the ever increasing popularity of the automatic and waterproof watches offered. A reaction was needed. Secondly, in 1969, a landmark year for mankind and a landmark year for the watch industry as well, Breitling, Heuer, Seiko and Zenith announced the first automatic chronograph calibers: Heuer/Breitling/Büren with the Calibre 11, Zenith with the El Primero and Seiko with the calibre 6139. The group Breitling was aligned with, and started work in 1965 alongside Heuer-Leonidas, Hamiliton-Buren and Dubois Depraz. When representatives of these four companies met for the first time, they decided which role each of them should play, in the development of the automatic chronograph caliber. Büren would be in charge of the special automatic mechanism, Dubois-Depraz would be responsible for the chronograph module, while Breitling and Heuer would develop the other components and oversee the design of the watch dial and case. 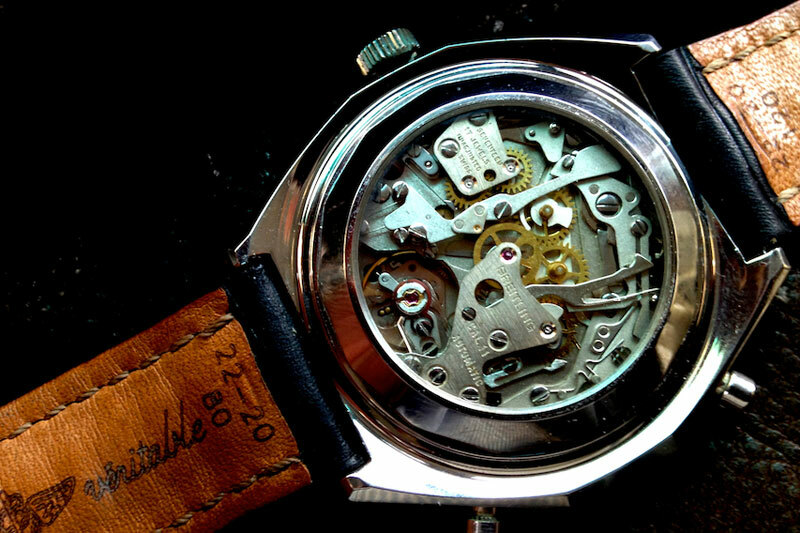 In 1967 they asked for the patent of the calibre 11, while a year later they had working examples ready. 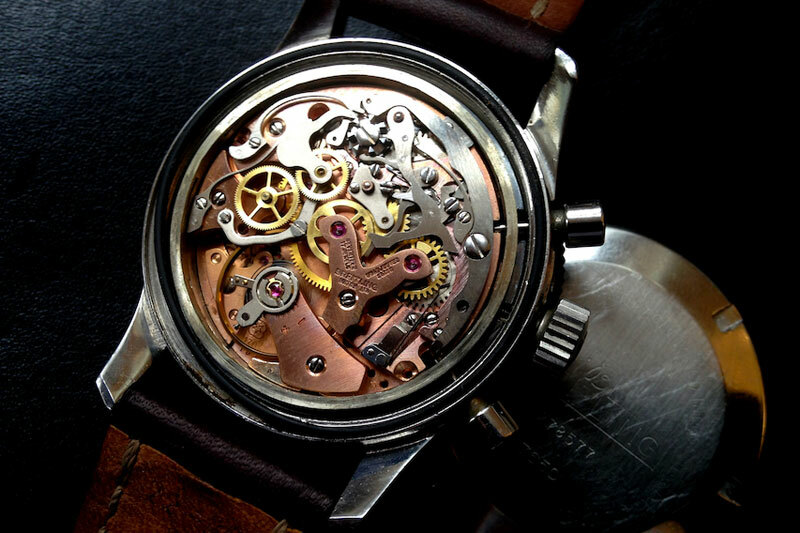 Calibre 11 beats at 19,800 vph, was a 13 ¾ ligne movement, which consists of a base movement with micro rotor, and a module unit. These two units are attached with screws, one on top of each other. The design required that the winding system with the crown had to be removed to the position of 9 o’clock – the opposite of the crown’s usual place. Also a suitable winding mechanism was required for this automatic chronograph which was a heavy microrotor that wound the mainspring and was housed in the basic movement. The automatic chronograph movement was now a reality and in the third part of our article we will see what was the impact of this in the family of the Breitling Avi/Co-Pilots.